In this presentation, we will discuss scaling choices to Big Data, your options, decision points, and how to use existing infrastructure. 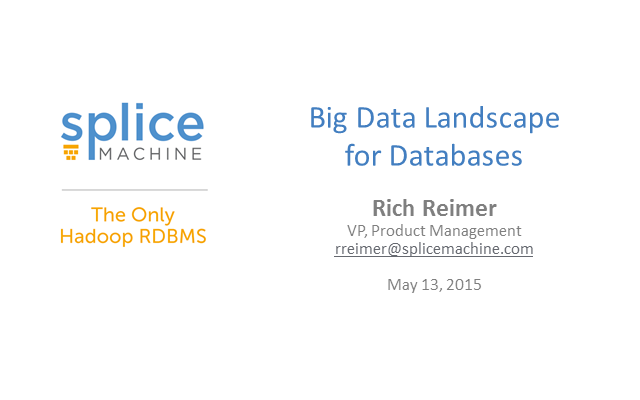 Traditional relational databases like Oracle and IBM have been the de facto RDBMSs for decades. They do many things very well and are still a strong choice for high performance transactional systems, especially for data volumes below a few terabytes. However, when data volumes begin to scale, many enterprises are looking for more cost-effective alternatives. Distributed computing (i.e., the ability to scale out on commodity hardware) is a disruptive technology underpinning the new wave of database innovators such as SQL-on-Hadoop, NoSQL and NewSQL solutions. These solutions can offer a dramatic price/performance improvement over legacy databases. Incumbent database vendors have faced threats to their dominance in the past, but it is different this time, because of the volume, velocity, and variety of data growth. In this presentation we will cover an overview of the Big Data landscape with a focus on scale out architectures.